The rescue team consists of 6 wardens and over 40 members, mainly from Dudley Caving Club (DCC) and Shropshire Caving and Mining Club (SCMC). 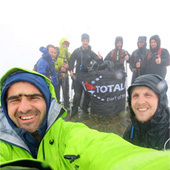 The teams rescue store contains a variety of equipment including stretchers, rope access gear, hauling equipment, VHF radios, underground radios, telephones, warm air re-breathing equipment, bolting equipment, casualty evacuation bags, etc. The Team is called to an incident by the Police, who having received a call for assistance, will contact one of the MCRO Rescue Wardens who in turn call out team members. 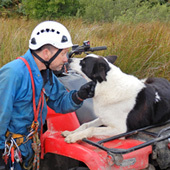 Team members can be called any time of the day or night and undertake training in all aspects of the technical and medical requirements of underground search and rescue. Although the area we cover is comprised mainly of old mine workings, we have been very fortunate in that there has only been one major incident in our area for a number of years. One of MCRO's main roles is as a backup team to other CROs and as a result of this we are called out to provide assistance to other neighbouring Cave Rescue teams, with whom we regularly hold joint practices. MCRO does not train people to cave. 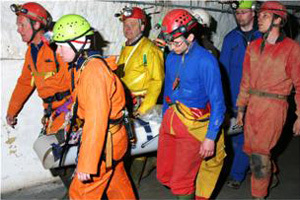 Anyone wishing to join MCRO in the capacity of an underground rescuer is expected to have a minimum of two years of proven caving experience, be an active member of a bona fide caving/mine club, is expected to be reasonably competant and fit, is known to the team and attends rescue practices. An individual must also be self-sufficient and have their own suitable personal caving equipment including lights, SRT kit etc. 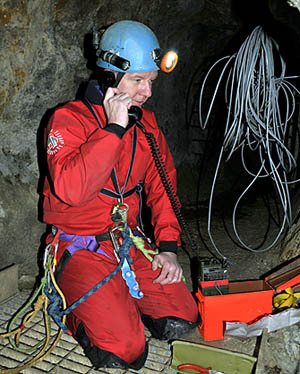 Membership forms are available from the Secretary for individuals who have a genuine interest in underground exploration and rescue together with an ability to demonstrate an interest in the furtherance of MCRO's objectives.